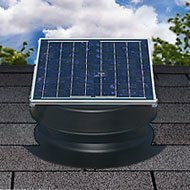 The Solar Attic Fan is a simple and environmentally sensible solution that can save you money. Powered completely by free solar energy, this sleek and efficient vent is both compact and quiet. Fully operational right from the box, it installs easily, with no electrical wiring, no expensive electrician and city permits. And let's not forget powerful! A single 24 watt unit can fully vent up to 1,800 square feet, operating at up to 1,339 cfms. Place it wherever you need improved circulation; attics, lofts, workshops, storage sheds, garages, even barns. The 24-watt Natural Light Solar Attic Fan exhausts up to 1,339 CFM, and up to 2100 square feet of attic space. No wiring needed. 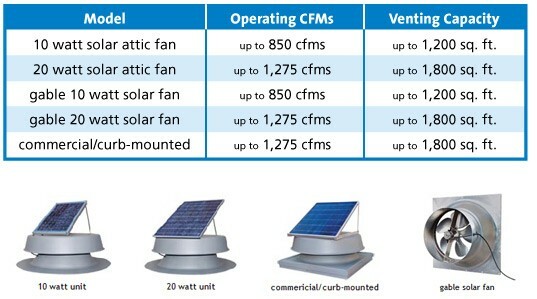 Lower your electricity consuption using this high quality solar powered attic exhaust fan today!